It’s the height of World War II. In a London beset by air raids, comedian Sammy Shaw (Gary Wilmot) is doing his bit to keep the nation’s morale high with his radio show, broadcast live from a West End theatre. He is supported by a company of talented singers, dancers and musicians – including his long-suffering girlfriend, Olive (Sara Crowe). The show is under threat, not only from the Nazis but also from the BBC. The corporation’s rules about what is acceptable and what is not are a headache for Sammy; he is forever having to cut items and find new material. Add Olive’s ex, matinee idol Gary Strong (Michael Hobbs) to the mix and Sammy’s already strained relationship with Olive is brought to breaking point. The cast all sing, dance and play a range of instruments – the triple threat of musical theatre. It is unfair to single any of them out for special mention; they form too tight an ensemble for that. 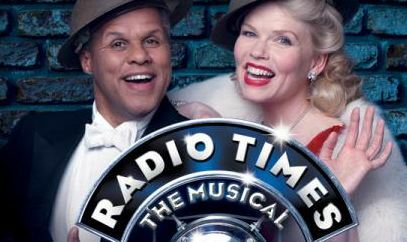 As cheeky chappie, Sammy, Gary Wilmot is well within his comfort zone, in his Max Miller suit, wise-cracking his way into and out of trouble. Sara Crowe is touching as the neglected Olive, with a ‘show must go on’ mentality, and a tolerance level that keeps her hanging on long after most people would have shown Sammy the door. Christian Edwards as sound engineer Jeeps is superb. He sings, he dances, he plays a mean trombone, as well as carrying the romantic subplot and becoming a hero. Amy, the object of his affection is played with elegance by Vivien Carter, who – like everyone else – is a dazzlingly versatile performer. I particularly liked John Conroy as stuffy producer Heathcliffe Bultitude – a stock figure from comedy: the killjoy. He shows he is full of surprises and contributes many of the comedic highlights of the piece. In a show where there is never a dull moment, highlights for me include “Hey Little Hen” which involves an outbreak of ukuleles, and the a capella rendition of “Run Rabbit Run” encapsulates the charm of the whole show. Sammy’s heartfelt declaration to Olive, via song, is the emotional punch of the piece, proving Wilmot is not just a cheeky face. The book is by Abi Grant and Alex Armitage, drawing on the traditions of British comedy. The script is relentlessly funny, dripping with innuendo and silliness. I wonder how much the BBC’s restrictions fostered this type of comedy, where the filthiest things can be mentioned and alluded to through coded references and euphemism. Round the Horne probably wouldn’t have existed without the constraints imposed by that little green rule book. The characters punctuate their corniest lines with an Arthur Askey-esque “I thang ew” – it is the equivalent of writing LOL at the end of your text messages or status updates, except here it is charming. The score is purely the work of one composer from the era, the marvellous Noel Gay, whose name sums up his best work (from a time when ‘gay’ meant bright and cheerful). The show is a testament to his talent for writing catchy tunes. Like the wisecracks, the hits keep coming. Caroline Leslie’s direction keeps proceedings cracking along at a fair old pace. The show is slick, wildly funny, surprisingly touching andman unadulterated delight. Much as the Light Programme boosted spirits and cheered the nation up during the war, this production is a much-needed tonic in these grim and austere times.